Our unisex World’s Cutest Tax Deduction baby bodysuit romper makes a great gift for newborns, babies, infants, baby showers and expecting mothers. This Funny Baby Onesies is the perfect gift. Our AW Fashion design printed with pride in the United States. This is an original inspired design and does not infringe on any rights holder’s rights. Over 100,000 happy costumers with 98% customer satisfaction. 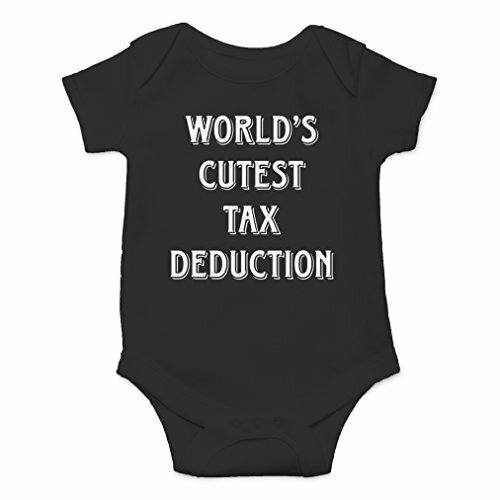 Our AW Fashions “World’s Cutest Tax Deduction” baby one piece is printed on premium Rabbit Skins 5 OZ 100% cotton. This hilarious design will have all your friends and family laughing at your next special occasion. These durable, comfortable baby rompers are guaranteed to make a perfect gift for your expecting friends, baby shower gifts, or a present for your nieces and nephews. Not only is this item 100% combed ring spun cotton, it also has a three snap closure to guarantee this one piece will not come off until you want it to. On top of that, this feature makes changing diapers and clothing as easy as can be. This one piece is machine washable and is designed and printed in the USA. Sizing is made easy: Newborn/0-3 Months (5-9 lbs), 6 Months (3-6 Months) (10-16 lbs), and 12 Months (6-12 Months) (17-20 lbs). Why Choose an AW Fashion’s Product? We have searched far and wide for the picture-perfect baby Onesies for our fans and customers! We believe in making a romper your baby will actually want to wear. You’ll notice the quality right when you put it on. All of our bodysuits are screen printed in the U.S. We pride ourselves in high quality and want our Onesies and Shirts to be the first out of your closet every time! When you receive your item, please take a moment to verify that it was not damaged in transit. If there is any reason that you wouldn’t rate this as a 5-star experience, please let us know right away and we’ll do what we can to make it right.